Sets combines the apps and files you need to complete a task in a tabbed window—even ones you worked on weeks ago. 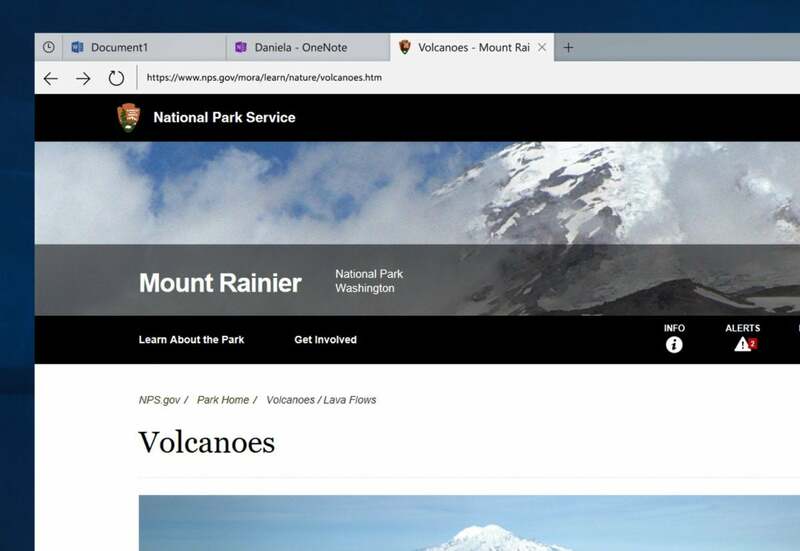 Microsoft said Tuesday that it plans to overhaul Windows 10 with a browser-like, tabbed application view dubbed “Sets” that groups apps and files by project. The changes will roll out over a period of months, if not years—but an upstart competitor already has a similar idea. Think of Sets as a mashup of existing and emerging Windows 10 technologies. Take Windows Explorer and the little-used Task View within Windows 10, mix in the newer “Pick up where you left off” and “Timeline” features, and wrap it all into a single-window experience. The idea is that every task requires a set of apps—Mail, a browser, PowerPoint, even Win32 apps like Photoshop—and those apps will be optionally organized as tabs along a single window. But that’s not all. Microsoft knows that one of the most difficult things to remember isn’t what you were working on a week or so ago—browser histories help with that. It’s remembering all of the associated apps and documents that went with it: a particular PowerPoint document, that budget spreadsheet, the context an Edge tab provided. The idea is that the delayed Timeline feature will eventually group and associate all of these into a Set, so that when you open one, Windows will suggest the others, too. 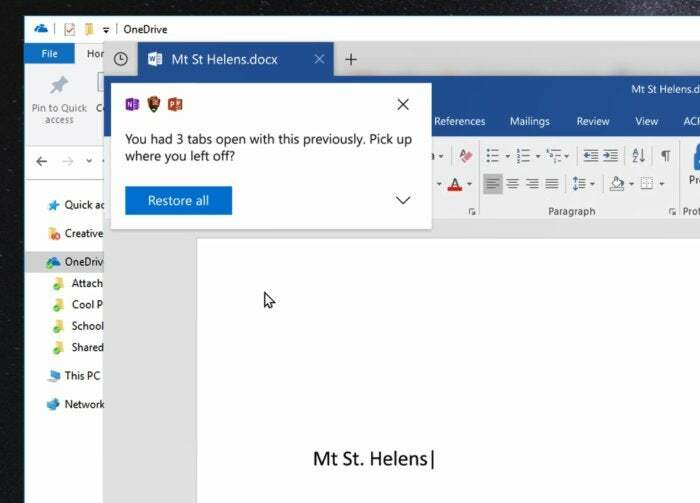 It’s a complex concept, with a complex tag line: Sets is a way to “organize and resume multi-faceted tasks,” according to Microsoft..
Sets will first make its way to Windows Insiders for feedback on the new UI. Microsoft will also seek out support for the Sets concept from developers across the board, from Adobe to Salesforce. Meanwhile, Stardock, which has provided its own UI tweaks to Windows for years, has struck first, releasing a product, Groupy, that reproduces some of the basic changes Sets provides. Microsoft is making clear that this is an optional feature, so if you prefer to work within a traditional Windows environment, rearranging windows and using features like Snap, you’ll still be able to. Though Timeline will also be enabled via Task View, you should also be able to access it via the icon in the upper left. This is not a web browser or a web version of Word; it uses the new Sets model. Note the new tab icon to the right. 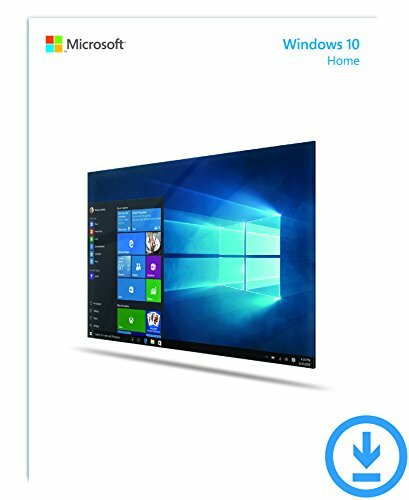 The concept includes two major components: the organization of the different app windows into Sets; and the longer-term evolution of how Windows intelligently recognizes how Sets should be formed, which is part of the rollout and evolution of Timeline. Timeline will be rolled out almost immediately to Insiders, followed shortly by Sets. 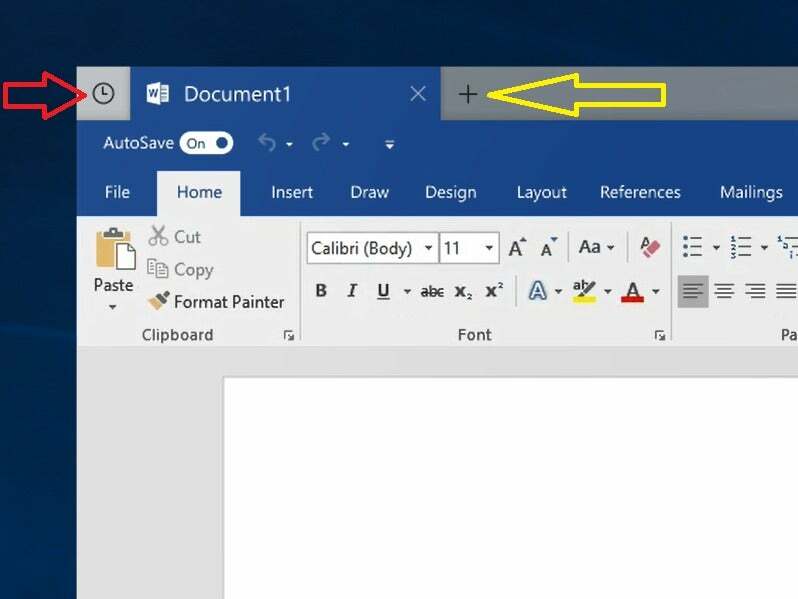 This is the traditional (and effective) way of working with multiple documents within Windows 10: Snap View. Sets would slim this down to just one window. You’ll see changes to the Windows interface with both aspects. With Sets, users will have the option to add apps to tabs, in much the same way Edge or Chrome works. Don’t be fooled—these aren’t web apps you’re looking at! Essentially, Microsoft is reworking the Desktop Windows Manager within Windows 10 to enable app switching via tabs, versus more traditional windows. The Timeline changes will also eventually roll out as part of another, neglected portion of the Windows UI: Task View, the icon that’s right next to the Cortana search bar on the Windows 10 taskbar. Opening a new tab will bring up this new tab page, which looks a lot like a web browser—except that Office documents are highlighted. 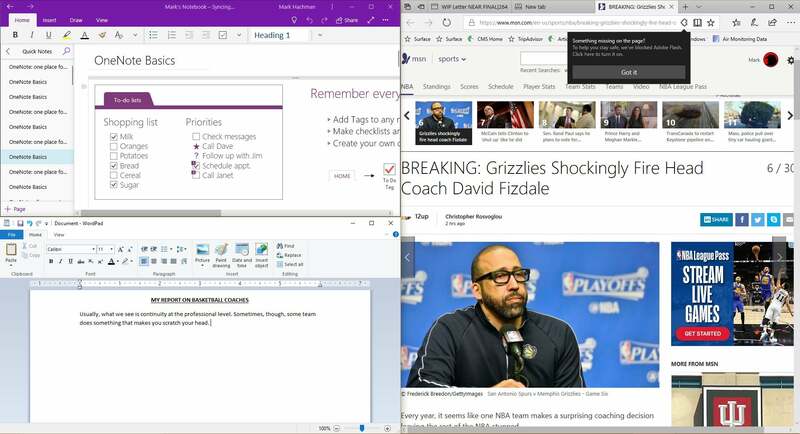 Normally, a student writing a term paper would launch several apps at once: a OneNote class notebook to pull from, additional research tabs within Edge, as well as the actual paper within Word. All of these apps rarely interact. There’s also the problem of what might be called “browser tab bloat:” Within a browser, users keep adding tabs, only some of which may be relevant to the task at hand. Sets, and later Timeline, will associate only the relevant apps and browser tabs with one another. Microsoft thinks that it has built mechanisms in place that either automatically, or with a slight change to user behavior, get the right things grouped together, within a Sets window. So while you have 32 tabs open in your browser, the two tabs you were using together with your homework are now with your homework. 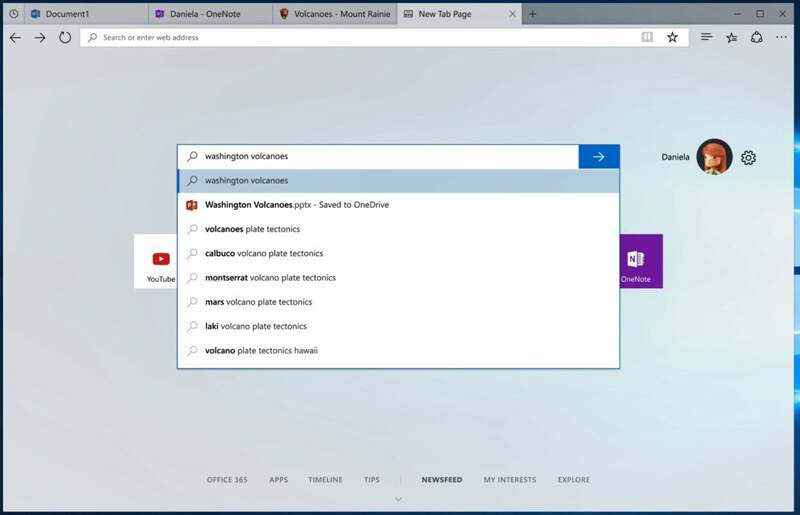 Interestingly, the new tab page within Sets also includes a search bar, which searches the web as well as your PC, just like Cortana. The early vision of Sets looked a lot like a browser: links in the Mail app opened in Calendar, right next to each other, and each tab could be dragged and rearranged. Searches for documents in a shared OneDrive were downloaded and opened as new tabs. UWP apps and traditional Win32 apps mixed together, each with their own tab. Naturally, it’s all keyed to your Windows account. In another scenario, a student saved her work on one machine and resumed on another. Once she signed in, Sets either suggested the group of app tabs she was working on previously, or just opened them automatically, picking up where she left off. Sets meets the “pick up where you left off” feature, offering to open up all of the prior app tabs at once. The Settings menu attached to Sets is designed so that the new interface is entirely optional, and can be toggled on and off. Microsoft also plans to make apps Sets-compatible on a per-app basis, so while Word and Mail could be tabbed, you could ensure Photoshop never is. Sets will start rolling out soon, possibly starting in late November—in the next few days, in other words—but it won't roll out quickly. You might not get it, even if you’re a member of the Windows 10 Insider program. Part of the testing process involves rolling out Sets to a limited group—including a “control group” of users who won’t get it, and can provide contrasting feedback. Sets will also be restricted initially to UWP apps, such as Mail and Calendar. In the version of Sets rolling out to Insiders, you’ll be able to create simple Sets, such as receiving an email about an event, opening the Calendar app in a tab to reserve the date, then finding the location on the Windows 10 Maps app. Over time, simple, traditional Win32 (.EXE) files will be supported, too, but only those that don’t modify the title bar. Those apps may be added to Sets by the end of 2017, but most likely will appear early next year. From there, the plan is to add the more complex Win32 apps that modify the title bar. The most important of these? Office 365 apps. Traditional Office 365 apps like Word, with support for Sets, will be added sometime in 2018. From there, Microsoft has a choice: Either work with developers like Adobe to code Sets support into apps, or do it independently. It appears Microsoft will try the former path. At some point, everybody will get Sets, Microsoft says. But it will take months. But if what you could get something like Sets, right now? 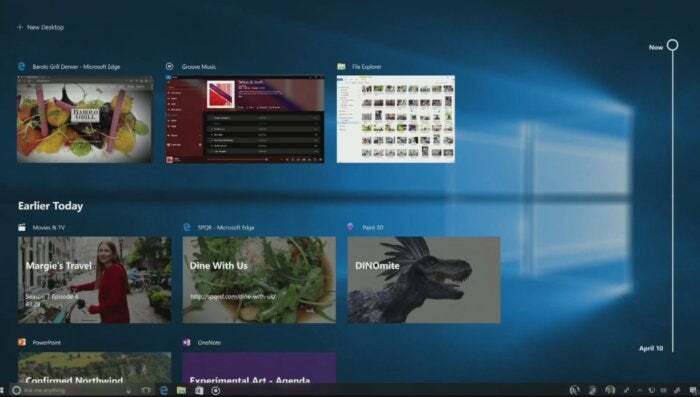 There’s an alternative: Stardock’s Groupy app, which recently debuted as a beta for Windows 10. The Stardock Groupy app does a nice job of replicating the Sets vision, collecting groups of windows together. Groupy (currently part of the $30 Object Desktop Suite) does quite a bit of what Sets promises: It groups apps together as a series of tabs, allowing you to hide applications underneath one another without losing them. New apps can be collected and added to the Groupy window (which, at this point, isn’t really resizable like a true window) or pulled out from a Groupy group and left as separate windows. What can’t be done, right now, is for those Groupy groups to be “archived,” as Windows Timeline will do. You can also end up with two rows of tabs, when a row of browser tabs appears underneath the Groupy group's app tabs. 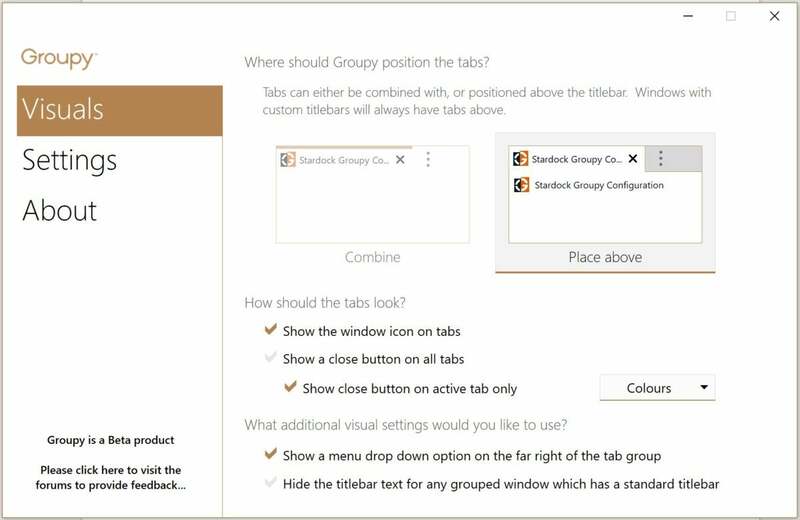 The Groupy settings menu offers a variety of options for configuring the tabbed groups of apps. Naturally, Groupy is more of a custom interface than a built-in part of Windows. But it’s still a good start. You can pay $30 now for the suite, or Stardock will release a standalone version of the app in December for $10. In some ways, Sets follows the same “from many, one” maxim that some of its more recent products embody: Delve’s ability to find relevant documents, Outlook Groups, the shared workflow in Teams, collaboration within Office documents. Sets applies that to your own workflow, with the idea that Windows will know all of the various documents you used to create a presentation, for example. 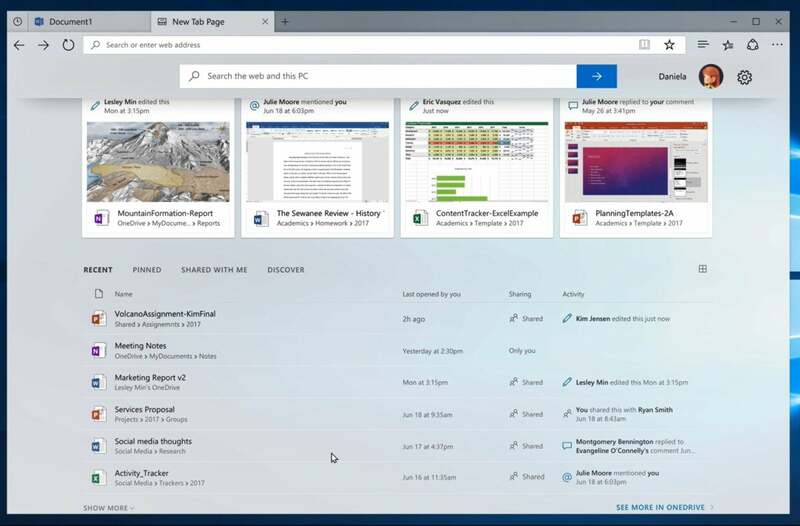 We can already see the first glimpses of Sets with Edge’s ability to “share” documents from Android or iOS to Windows 10 PCs, and with Cortana’s ability to suggest the apps you were using on another PC. Timeline sort of fell into place as a related technology, while the little-used Task View fell out of favor. An old version of Timeline that Microsoft showed off at its Build conference. Timeline will log your activities to the cloud, allowing those users signed in with a Microsoft account to roam from PC to PC. 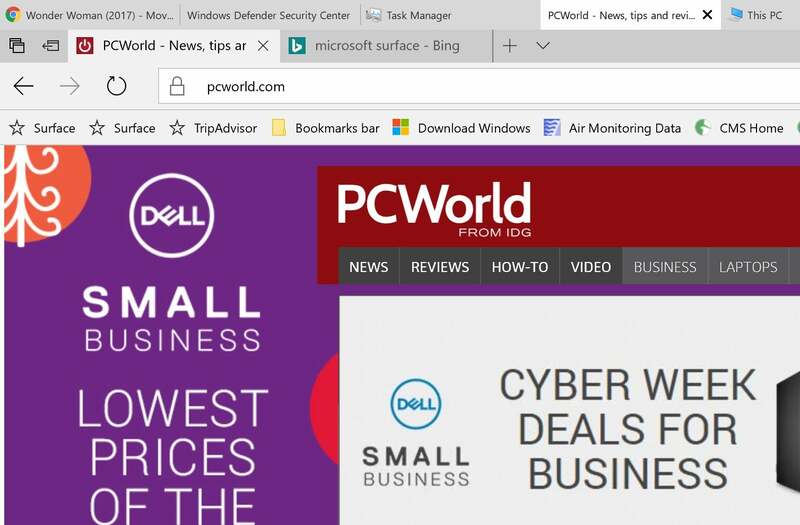 According to the early build PCWorld.com saw, Timeline dominated the space normally dedicated to the virtual desktops within Task View. Because of the relatively low amount of data needed to record Timeline, there was really no practical limit to how far Timeline's history could go. One thing Timeline won’t be used for—at least not now—is versioning. If you have a budget spreadsheet you altered a month ago, you won’t be able to call that version up, at least not within Timeline. Naturally, Microsoft is also working though how it implements Sets and Timeline within mobile apps—especially as, for all intents and purposes, Microsoft has decided not to develop new mobile operating systems. While Sets might be impractical within the constraints of the mobile phone, Timeline might be feasible, or at least a version of Timeline that’s aware of what your phone was doing before you sat down at your PC. All that, though, remains part of the very murky future for Sets and Timeline. It could be the end of 2018 or even early 2019 before general Windows 10 users have access to both, and much could change in the interim.